Syrian President Bashar al-Assad’s mouthpiece in Beirut today amazingly decries in the strongest terms the arrest by his security services of internationally acclaimed Syrian artist Youssef Abdelke. What’s going on in Syria? Whose mind assumes the army’s advances against the armed gangs justify reemergence of some regime figures’ mindset -- a chief trigger of Syria’s current crisis? Who is the genius – I mean jackass – who decided to arrest Abdelke? How can he convince himself, his family, his neighbors and the people of Damascus, the coastline, Aleppo, Homs, Deraa, Idlib, Raqqa, Hasaka, Deir Ezzor, Quneitra and Sweida that one man named Youssef Abdelke personified danger and had to be arrested? How can the head of a security branch, or someone in decision-making circles, take such a decision? Is he afraid of a statement penned by the artist, activist and man with a sense of ethics – ethics that some regime people in Syria lack? Which security branch took this measure as a matter of unsupervised and unaccountable routine? Who chose to face up to Youssef and his colleagues, who are Syrian citizens striving for regime change without advocating or endorsing its prevailing concept? Their position against all shapes and forms of foreign meddling in the Syrian crisis preceded the positions of many. Who chose to execute the opposition qualified to rehabilitate Syria as a strong and coherent state liable to rise again and return to life? Even a name mix-up does not justify Youssef and his colleagues’ arrest, which can only be described as foolhardy, hypocritical, mindless and brutish. All that can be said is “shame” to whoever thought of taking this criminal step. Any delay in setting Abdelke free gives a negative signal that some people in regime circles only want a heart-eating and heartless opposition. We know which road leads Syria to peace. I suspect Abdelke’s arrest follows his signing of a statement by Syrian intellectuals. The statement carries the signatures of 100 intellectuals, university professors, artists, journalists, actors and cinematographers. The document calls for a political solution featuring regime change and a transitional governing body with full executive powers. Surprisingly too, al-Akhbar carries the statement in full and the names of its 100 signatories. Abdelke, 62, of the banned Communist Labor Party, has long criticized Assad and his late father, Hafez Assad, who ruled Syria for 30 years until his death in 2000. Two party colleagues, Tewfik Omran and Adnan Abbas, were arrested along with Abdelke and taken to an undisclosed location. All three had served previous jail terms for political dissent. A native of Qamishli in northeastern Syria on the border with Turkey, Abdelke graduated from Damascus University’s Faculty of Fine Arts before spending the best part of two years in jail ending in 1980, when he moved to Paris. In 1986 he received a diploma in Etching from L’École Nationale Supérieure des Beaux-Arts de Paris and three years later a PhD in Plastic Arts from Université Paris 8. Protest had been part of Abdelke’s upbringing. His father had been imprisoned many times during the 1960s and 1970s. Abdelke moved back to Syria in 2005, after living a quarter of a century in a kind of self-imposed exile in Paris. He returned above all because he missed home and because he is, in the end, a Syrian artist. His subjects tend to be still-lives, benign seeming at first: fish, birds and other animals, ambiguously dead or alive. “To be dead but to refuse to be dead,” was how he described them. A respected engraver and master draftsman, he is a great observer of living phenomena, and while he is precise and methodical in his approach, there is also a poetic side to his work. Abdelke has worked in different areas of graphic art, and is known for his posters, logos and book covers in addition to his etchings and collages (see photo albums on his Facebook page here). He also has authored over 30 children books and has published several manuscripts on the history of caricature in Syria and the Arab world. 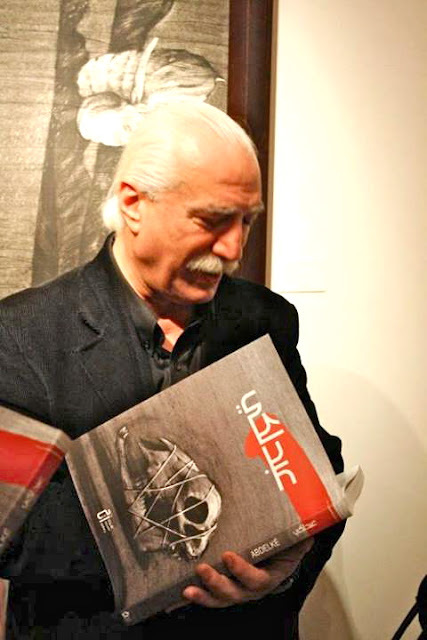 Abdelke has exhibited throughout the Middle East, North Africa and Europe and his artworks can be found in the British Museum, the National Museum of Kuwait, the National Museum of Damascus and many other public institutions. Opposition groups say several other civil rights activists have been arrested this week, in what they say is a sign that the Damascus government is ramping up pressure on those who eschew violence and advocate peaceful resistance to Assad. "Assad's forces are intentionally targeting the groups that are not associated with the armed revolt. They want to make them feel the only choice is the rebels or the regime," Samer Aita, a member of the Syrian Democratic Forum, told Reuters in Beirut.